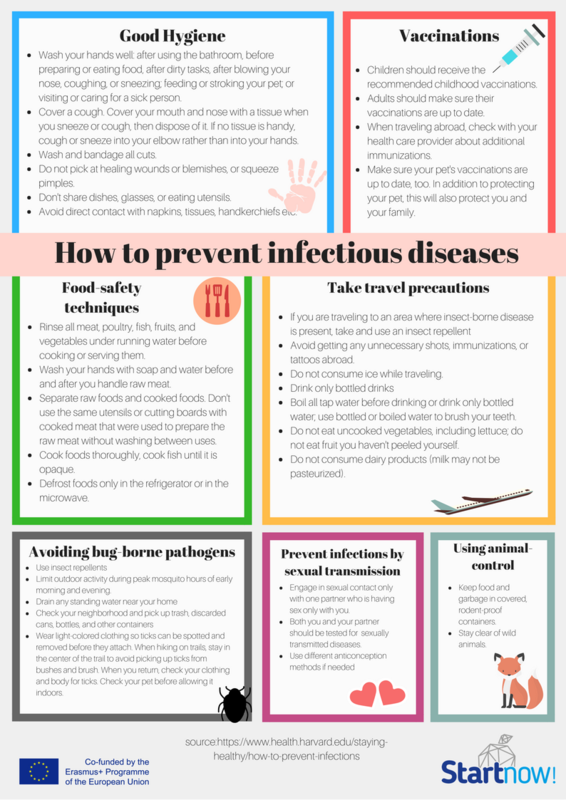 I’m sick of disease – Start now learning! The Facilitator asks the group to make a circle and explains that it is a common phenomenon for people to catch the flu, from time to time. The game will be based on this statement and as in real life, its purpose will be to get rid of the flu, as fast as possible. The „FLU” in this game is a ball and the participants, while standing in a circle, have to throw it at each other (one by one) while music is played on the background. Once the Facilitator stops the music, the person who stays with the „FLU” (the ball) in their hands, loses the game and has to sit down on the floor. Then the Facilitator turns on the music again and the game goes on, until there is a winner – the person who did not stay with the ball while the 2 last players were left in the game. Prepare a tag for the ball writing the word „FLU” in CAPITAL LETTERS, to be visible to everybody! Choose energetic music, for participants to have fun while playing. Make sure that after each round, the ones that lost sit down on the floor. The Facilitator informs participants that they will learn and be demonstrated different ways through which pathogens spread. At the beginning, the Facilitator asks the group to share what they already know about pathogens, which cause diseases and how those pathogens can be spread. After the introduction, the Facilitator divides participants into 4 groups and gives each team with a piece of instruction „How do pathogens spread”? Since there are 4 different ways, each team is asked to read out their instruction and prepare a demonstration for the other participants, using material provided by the Facilitator. The Material is put on an accessible table, in order for every team to take whatever they need for their presentation and whatever their manual indicates. When all groups are ready, each group presents their demonstration in front of the other participants. The Facilitator encourages participants to ask questions during each presentation. 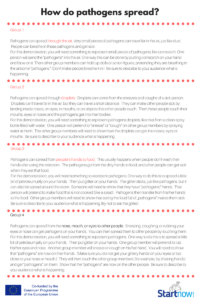 What are the ways in which pathogens spread? 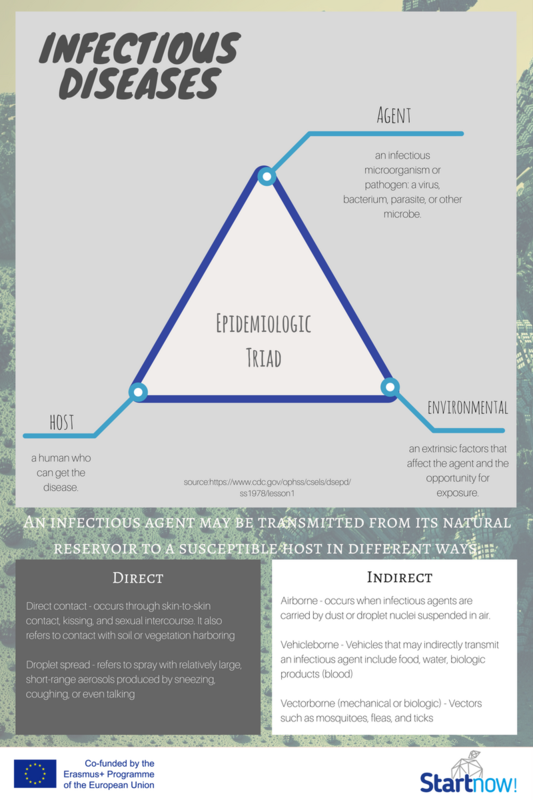 Is it easy or difficult to get the pathogens? In which situations can we get infected? What do the pathogens transmit? 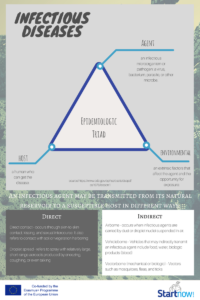 After the discussion, the Facilitator can distribute the infographic „Epidemiologic Triad” to finalize the exercise. 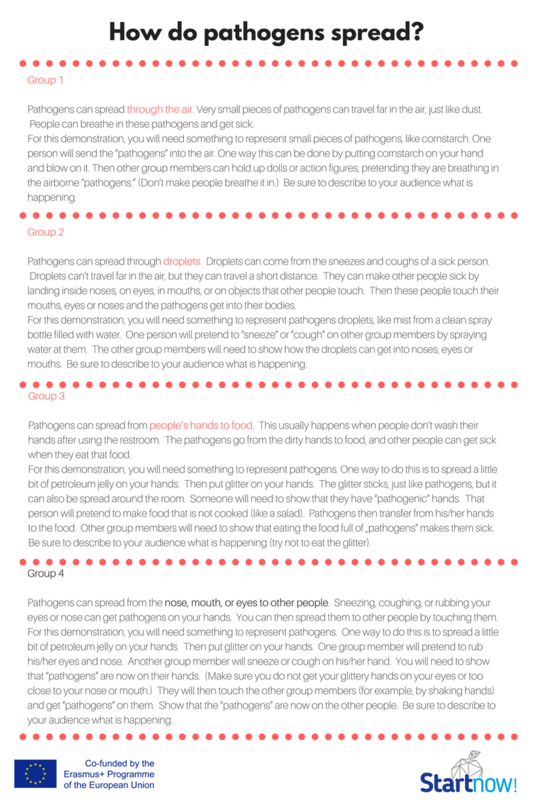 Appendix 1: "How do pathogens spread?" Short, general info about the disease. At the end, when all brochures are ready, each group are asked to present them, take pictures and post them on social media, promoting the project. The Facilitator should also hang them in the room, so other people can see and read them. Appendix 3: "List of the most common communicable diseases"
Make sure, that every group chooses a different illness – if they cannot decide themselves, you can choose for them or prepare names of the diseases, write them on a small piece of paper and put them in the bowl, for each team to draw one. Remember to remind groups to work together, prepare their brochures in a clean, aesthetic way based on reliable information. Duration: around 30 – 40 min. What could lead to a person touching another person’s blood? Trying to help, curiosity and others. How can we help someone without touching their blood or other fluids? You can get an adult, offer tissues to a bleeding person or a person with a runny nose. After a short discussion, the Facilitator divides the group into 7 smaller ones and distributes short scenarios, asking each team how they would react if the specific scenario happened to them? Each group is given about 10 minutes to come up with a brief strategy, which they will present later. After each presentation, the Facilitator asks the other teams to foster discussion. Question: What are the signs of a cold? Answer: a runny nose, a headache, sneezing, sometimes a sore throat. Question: Can medicine help curing a cough or a cold? Answer: NO, most colds and coughs are caused by viruses. Viruses cannot be cured using medicine. Some medicine, however, may help to alleviate symptoms while the virus naturally runs its course. Question: What is pneumonia and what are its symptoms? Answer: Pneumonia is an infection of the lungs that can make you very sick. The symptoms are: rapid breathing, fever or teeth-chattering, a cough with greenish mucus or tinged with blood, chest pain that feels worse when you cough or breathe in, and nausea and vomiting are all additional signs of pneumonia. Question: How can we prevent or reduce pneumonia? Answer: Avoiding smoky or dusty rooms, avoiding contact with people who have a cold (helps to prevent a cold from becoming pneumonia), Immunization against pneumonia (vaccine), hygiene. Question: What is the flu? Answer: Influenza, commonly known as the “flu,” is an extremely contagious respiratory illness caused by influenza A or B viruses. Question: When flu mostly occurs? Answer: Flu appears most frequently in winter and early spring. Question: What is the difference between a cold and flu? Answer: The common cold and flu are both contagious viral infections of the respiratory tract. 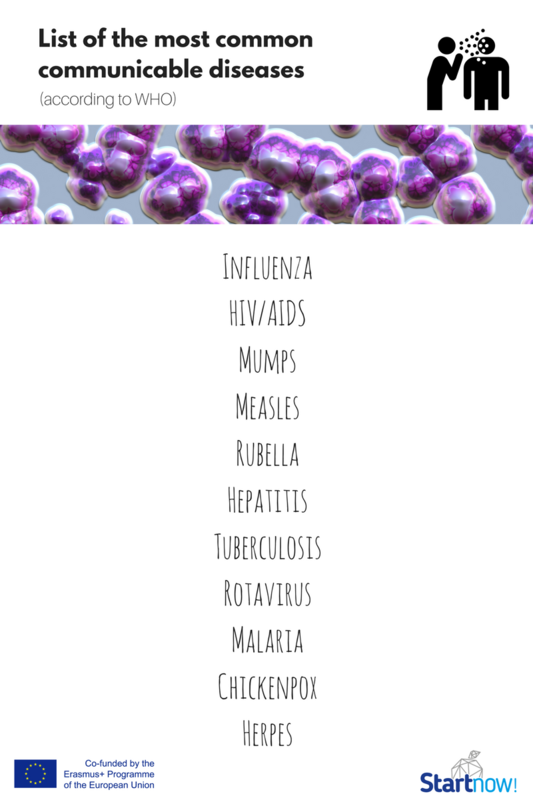 Although the symptoms can be similar, flu is much worse. A cold may drag you down a bit, but the flu can make you shudder at the very thought of getting out of bed. Question: How is flu spread? Answer: The flu virus is spread from person to person through respiratory secretions and typically sweeps through large groups of people who spend time in close contact, such as in daycare facilities, classrooms, college dormitories, military barracks, offices, and nursing homes. Question: What is rotavirus and how can we prevent it? Answer: This easily spread virus causes inflammationin the stomach and intestines. It can cause severe diarrhea, vomiting, fever, abdominal pain, and dehydration in infants, young children, and some adults. Frequent hand washing and disinfecting surfaces helps, but nothing is a guarantee. Vaccination is recommended. Question: what is meningococcus? Answer: Meningococcal disease can refer to any illness caused by the type of bacteria. Keeping up to date with recommended vaccines is the best defense against meningococcal disease. Hygiene and not sharing food and utensils with the others are also very important. You do not need to ask all the questions – the choice is yours how many and which. You can think about some small quiz prizes for the winners. This activity can be implement as the result of the above workshop, but it can also be implemented as a Facebook post, under which people can leave comments with answers. The Facilitator asks the group/Facebook audience to come up with 1 idea on how to protect and prevent themselves from getting a disease. Once everybody comes up with different thoughts, the Facilitator asks the group to write their propositions on the piece of paper and put the paper into the „JAR OF INSPIRING PROTECTION” – which can be used in the future during other workshops, or as a promotional material, or as a hint for those who will need information like that. 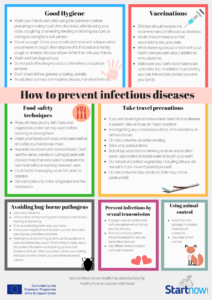 Appendix 4: "How to prevent infectious diseases"
After activity, the Facilitator can distribute infographic “How to prevent infectious diseases” (Appendix 4) as an additional material.